This Christmas, my big gift from Casey and the boys was a shiny new (red) iPod nano that replaces the 3+ year old 3rd generation iPod that died on me over six months ago. It was a great surprise, and is an amazing piece of technology. Seeing Cover Flow on a tiny 2-inch screen is unbelievable. 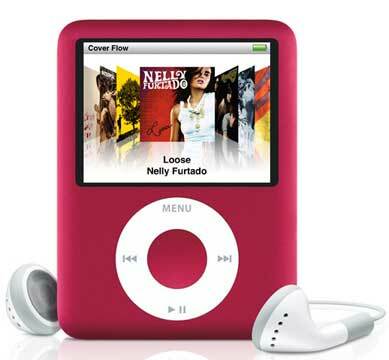 One of the features currently exclusive to the iPod Nano is the ability to use the Nike + iPod add-on. This kit has two pieces – a transmitter that you stick in your shoe and a receiver that plugs into the bottom of the Nano. While you run/walk, it lets your iPod keep track of the details of your workout: time, distance, estimated calories burnt, etc. Then, when you sync your iPod with iTunes, your workout data is automatically uploaded to the Nike+ website, where it is logged against your goals and graphed to give you a visual view of your run. Overall, Nike + iPod is a very well designed product that actually manages to provide extra motivation in achieving those fitness goals. Sure, there are a few things that could be improved, like being able to use PowerSongs while listening to podcasts and finding some way to track heart rate, but if you already have a Nano, the kit is well worth the $30 extra dollars. Are you really more motivated by the Nike thing or is it more of a novelty attraction? For me I would see the hard data as being mostly erroneous when compared to the clothes fit test or a physician’s report. For me, it helps in a couple of ways. First, during my workout I get periodic status/progress updates right through my iPod’s headphones. A friendly voice makes sure I know how far I’ve gone and what my current pace is. As the end of the workout approaches, the updates come more quickly – 400 m to go. 300. 200. 100. And if I end up beating one of my best personal records, I get a little congratulations message from Lance Armstrong or one of several other famous athletes. And then there’s the web portion of Nike+. Here, I can set longer term goals – Run 30 miles in January, beat my best run time three times in February, etc. Each run gets counted toward your goals automatically when you plug the Nano in and it uploads your data. You can also participate in group challenges, such as the one for beginners that challenges you to be the first to run 120 miles between Feb 1st and Nov 30th. They even give you a little showcase area to display your trophies and awards from accomplished goals and challenges. So, it sounds a little cheesy, and it probably is. But, it seems to work for me, and for a lot of others. Nike seems to have employed some good psychological research to this product, because it seems to do subtle things to nudge you on. I can tell you straight-up that I wouldn’t be running consistently if I wasn’t using the iPod/Nike+ combo. The strategy that seems to work best for me is to set one large goal (lose 30 lbs, run 50 miles in a month), then break that up into micro goals that don’t seem so daunting – lose 1 lb per week, run 3.3 miles every other day, etc. For this, the data and feedback I get from Nike+ are a great help.